Laurence Lyon (Larry) Teal, professor emeritus at the University of Michigan's School of Music, died Wednesday at St. Joseph's Mercy Hospital at the age of 79. 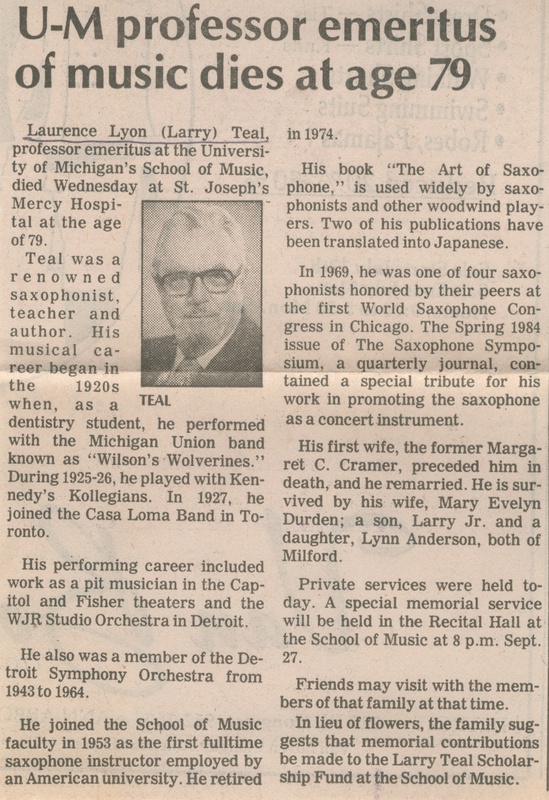 Teal was a renowned saxophonist, teacher and author. His musical career began in the 1920s when, as a dentistry student, he performed with the Michigan Union band known as "Wilson's Wolverines." During 1925-26, he played with Kennedy's Kollegians. In 1927, he joined the Casa Loma Band in Toronto. His performing career included work as a pit musician in the Capitol and Fisher theaters and the WJR Studio Orchestra in Detroit. He was also a member of the Detroit Symphony Orchestra from 1943 to 1964. He joined the School of Music faculty in 1953 as the first fulltime saxophone instructor employed by an American university. He retired in 1974. His book "The Art of Saxophone," is used widely by saxophonists and other woodwind players. Two of his publications have been translated into Japanese. In 1969, he was one of four saxophonists honored by their peers at the first World Saxophone Congress in Chicago. The Spring 1984 issue of The Saxophone Symposium, a quarterly journal, contained a special tribute for his works in promoting the saxophone as a concert instrument. His first wife, the former Margaret C. Cramer, preceded him in death, and he remarried. He is survived by his wife, Mary Evelyn Durden; a son, Larry Jr. and a daughter, Lynn Anderson, both of Milford. Private services were held today. A special memorial service will be held in the Recital Hall at the School of Music at 8 p.m. Sept. 27. Friends may visit with the members of the family at that time. In lieu of flowers, the family suggests that memorial contributions may be made to the Larry Teal Scholarship Fund at the School of Music.